Unique, exotic, a work of art. An extremely complex design gives way to simplicity of form. 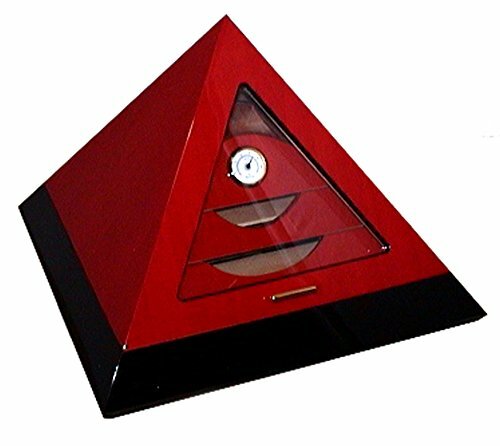 Just one glance at this rare and beautiful pyramid humidor and you will appreciate the virtues of true craftsmanship. Wood Grain color with High-gloss Multiple lacquer finish. Hold up to 100 cigars depending size of cigar. Beautiful Glass Window at Front. 2 Solid Brass Polished solid brass heavy duty side rail hinge with lid stay that stops at 95°. 1 Brass heavy duty piano hinge. If you have any questions about this product by Le Veil, contact us by completing and submitting the form below. If you are looking for a specif part number, please include it with your message.